I'm so sad to say goodbye to November, one of my favorite months of the year mostly because of my birthday and it's the start of the holiday season. This month I continued therapy, celebrated my 26th year on this Earth, I was featured on And Comfort's website, and so much more. 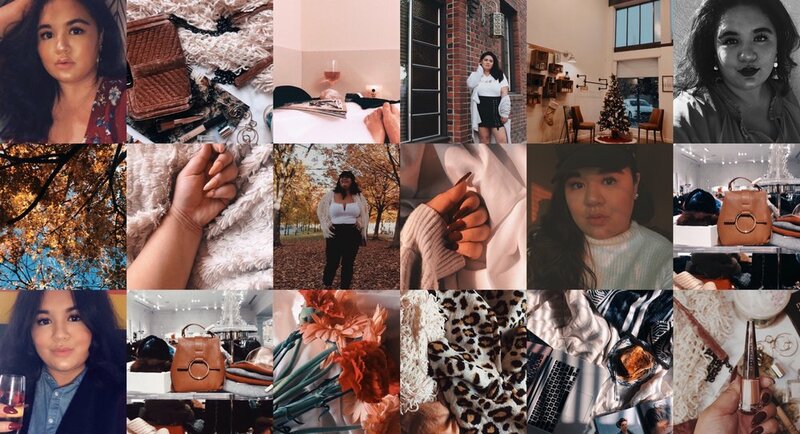 Keep reading to see what else I got up to this month, what I wore, bought, listened to, watched, ate, and drank. This month I continued therapy using Talkspace which I talked about briefly in last month's rewind. I celebrated my 26th birthday. I can't believe I've been on this Earth for 26 years! I celebrated my birthday by having dinner at one of my favorite sushi restaurants, Mikuni. As always it was amazing and at the end of our dinner, I got to spin the wheel for a prize. One year I won a bag of rice. This year I won a t-shirt which I haven't stopped wearing since I won it. I finally got to see some of the photos from the Fall Lookbook that I did with the minimalist plus-size brand And Comfort. I'm still geeking out at being featured on a brand's website! The Sephora VIB Sale was also this month. You can read about everything I picked up in my latest blog post What I Bought at the Sephora VIB Sale. I picked up some really awesome pieces during the Black Friday and Cyber Monday sales. I'll be doing a blog post on everything I bought once it arrives in the mail so be on the lookout for that, but there are some pieces that I'm obsessed with that I wanted to share with you now. I was scouring stores both in-person and online for the perfect pair of ankle boots that were fashionable, appropriate for work, and comfortable enough to wear for eight hours or more. I bought my first pair of Valerie Microsuede City Ankle Fashion Boots in the leopard print from the Target brand A New Day as a birthday present to myself. I loved them so much that I had to pick them up in black too and I'm definitely considering buying them in white as well. They're so chic, go well with everything, and most importantly they're comfortable. It was that time of year again to stock up on Vanilla Bean Noel Lotion from Bath & Body Works. This is one of my all-time favorite lotions and one that I buy every single year. It's moisturizing and it smells fantastic. I've been wearing this lotion since I was in the 5th grade! Yes, I'm one of those people who starts listening to Christmas music once November 1st hits and I'm not afraid to admit it. Last year, I made my 'Tis the Season playlist on Spotify which is a collection of my favorite Christmas songs. In addition to Christmas music, I have also been listening to my Scorpio Season playlist which features one of my current favorite songs that I can't stop listening to which is "thank u, next" by Ariana Grande. I've been eating pumpkin pie probably since before November began. I could eat it for breakfast, lunch, and dinner. It's my absolute favorite dessert and every year on my birthday I have a pumpkin pie instead of a traditional birthday cake. I've also been loving the Toasted White Chocolate Mocha Frappuccino Blended Coffee. It tastes just like jamoca almond fudge ice cream. When I'm in the mood for a hot drink, their Snickerdoodle Hot Chocolate is definitely my go-to this time of year. It's the perfect drink to cozy up with on a cold day.